Facebook is adding Video Option for Desktop App Install Ads which was previously available with only the mobile applications. Stats from Facebook show that 445 million people per month play mobile and desktop games on Facebook. And now the advertisers can reach to the users with video ads. 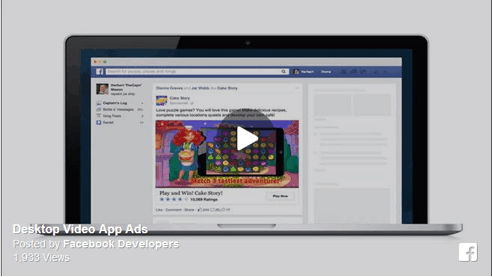 Facebook today announced that it’s giving advertisers the option to include video in desktop app install ads. The announcement will give the developers an extra option to attract their target customers more to the desktop Facebook games which will further increase the installation and engagement. The games which were launched on Facebook last year will not be able to take the advantage of the new feature launched but from now onwards the companies will be able to target their customers using the video ads.